Let's make pickled kale salad today, shall we? I pickle cabbage a lot because this is our traditional Ukrainian way to cook it. In the summer, though, we don't pickle cabbage, because new green cabbage is not as good for pickling as it is for variety of green cabbage salads. One day I received a beautiful bunch of organic kale, and thought, "Why don't I pickle kale?" Pickling would make kale more digestable and easy to chew. My main problem with kale is that it is such a hardy leafy green with earthy bitter'ish taste. It is hard to chew and, therefore, no matter how much you want to eat it and stay healthy, it's difficult to eat a lot of kale. How do I prepare kale in a way that makes is soft and not so bitter? The answer was somewhat creative: split the marinade into two parts: liquid and dry. Massage dry ingredients ( salt and sugar) into kale to make it less bitter and put it into the jar. Pour remaining liquid ingredients (water, oil, vinegar) over to marinade kale and make it softer. Voila! Pic 1. 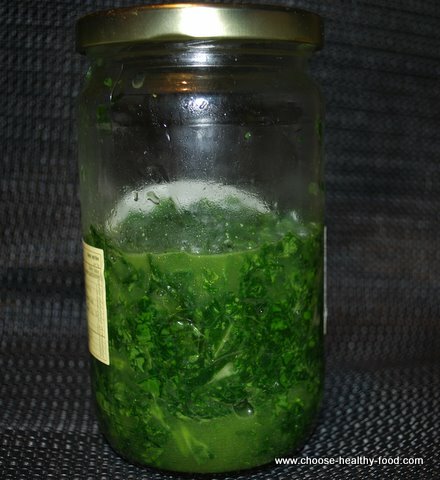 Pickled kale can be preserved in the jar for a long time. 20 kale leaves = 1/2 750 ml jar. Where to use pickled kale? You can eat it right away or three weeks later - it will be just as tasty. Great in salads, including couscous and tabbouli salads. Below is the recipe for a simple, quick, and tasty salad. Eat it as is. Boil some potatoes and eat it with the pickled kale. Order kale salads in the vegan restaurants, and compare it to this one. Please do not hesitate to use my "Contact me" form to tell me how much better my humble kale salad is. I appreciate your honest opinion! Pickling kale is a wonderful way to store it for the future in a very condensed form. When you have to process volumes ( whether from your own productive urban garden, or from the market), this is an ideal way to preserve kale. 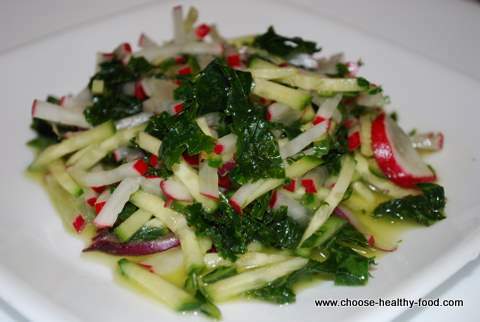 This pickled kale salad is vegan, unless you decide to use honey instead of sugar. Enjoy! Remember to set sugar and salt aside and massage them into kale. Wash kale leaves, discard the stems, shred the kale. Pour the marinade over in layers: one half of kale - one half of marinade, then add the remaining kale and the other half of marinade. Press the kale into the jar so that there is no air left between the shredded leaves. Put the jar into fridge. It is ready right away, and tastes even better the day after. Mix well in a and add pickled kale. Done!